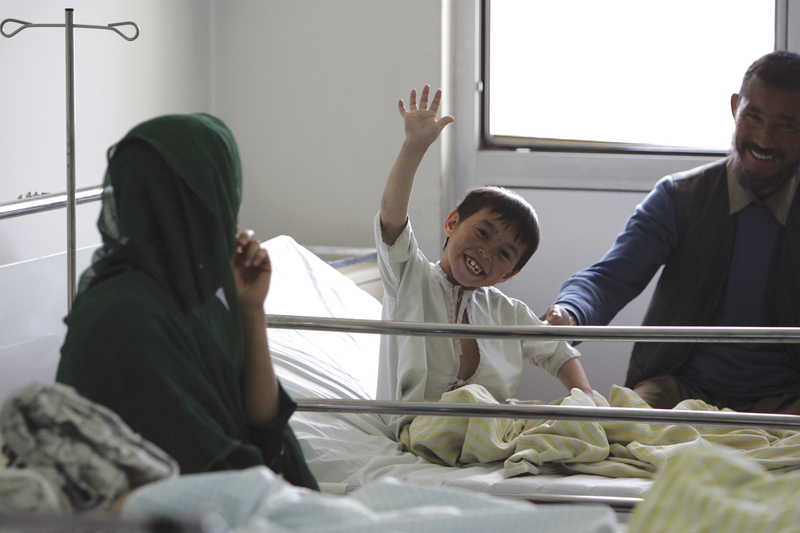 Sima (22) visits Dr Saeeda after giving birth to her youngest son - Bamyan Hospital, Afghanistan. In Afghanistan, with just two doctors for every 10,000 people, it is difficult for the country’s 30 million people to obtain timely access to quality health care. The French Medical Institute for Mothers and Children (FMIC), the country’s leading maternal and child hospital, is managed by the Aga Khan University. It is part of AKDN’s broader health system which provides quality primary and curative health care to over 1.6 million Afghans every year. 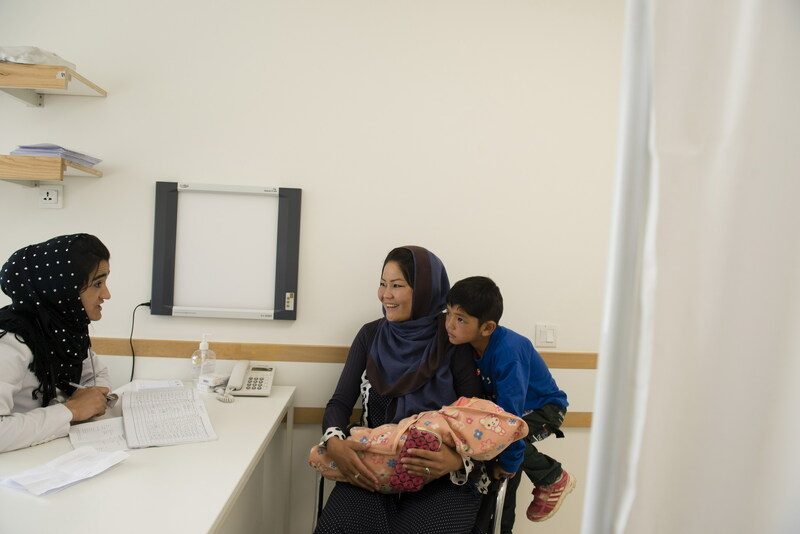 Paediatric services at the Bamyan Hospital, which AKHS already operates, include a Therapeutic Feeding Unit, a Neonatal intensive Care Unit, vaccination and TB-DOTS for effective treatment of tuberculosis. In a signing ceremony on 17 February 2019, the Aga Khan Health Services (AKHS) took over management of health care facilities in the Bamyan and Badakhshan provinces. Since 2006, the French Medical Institute for Children (FMIC) in Kabul has invested over US$ 16 million in its Patient Welfare Programme, changing the lives of over 200,000 patients from all 34 provinces of Afghanistan. Since 2004, AKDN has trained over 400 midwives in the country, about 10 percent of the total. The training of midwives plays a vital role in reducing maternal mortality, which in Afghanistan has dropped from 1,600/100,000 live births in 2003 to less than 400/100,000 live births in 2015. The Government of Afghanistan, the Aga Khan Development Network (AKDN) and its partners are working together to rebuild the health infrastructure of the country. 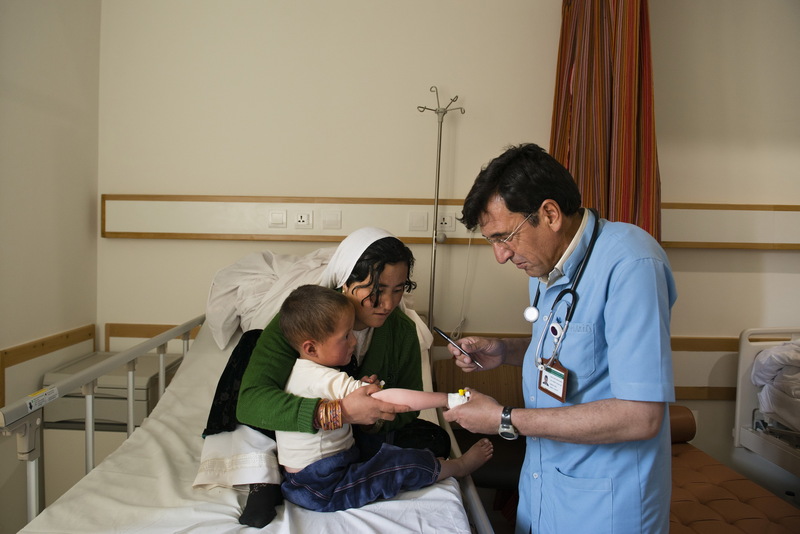 AKDN programmes range from health posts to hospitals to medical training. Every year, AKDN provides primary and curative health care through a health system – accredited by the International Organization for Standardization (ISO-certified) – to over 1.6 million patients. The system is comprised of four hospitals, 12 basic and comprehensive health centres, 11 sub-centres, one prison health clinic and over 125 health posts. In Afghanistan, the Aga Khan University manages the French Medical Institute for Mothers and Children as part of a partnership with the governments of France and Afghanistan and the French NGO La Chaine de L’Espoir. AKDN trains doctors, nurses, midwives, health professionals and administrators. It supports health policy, nursing standards and midwifery education. In 2012, for example, the French Medical Institute for Mothers and Children (FMIC) launched a programme in post-graduate medical education, which now covers seven disciplines (paediatric medicine, paediatric surgery, anaesthesiology, paediatric orthopaedics, paediatric cardiology, pathology and radiology). 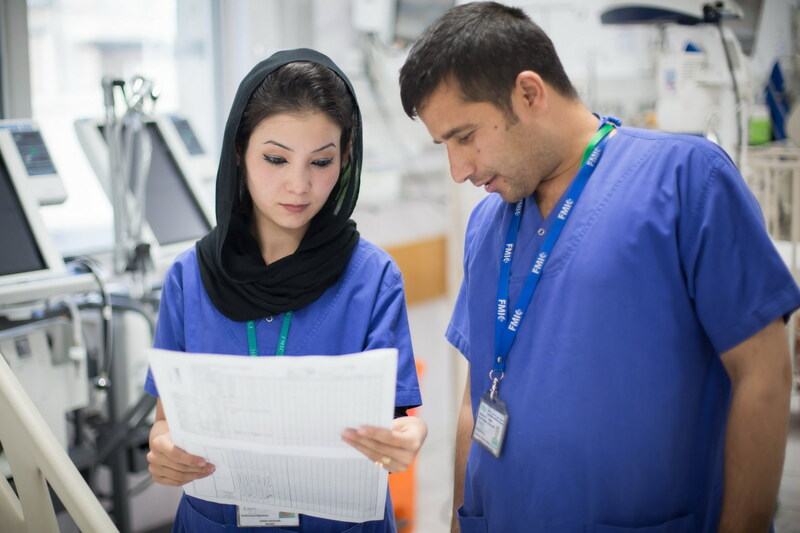 Additionally, more than 4,000 Afghan medical personnel have participated in diagnostic and training opportunities facilitated by e-health technology. AKDN has conducted medical education, training and learning sessions for nearly 13,000 health professionals. Since 2005, for example, AKDN has trained over 400 midwives in the country, about 10 percent of the total. 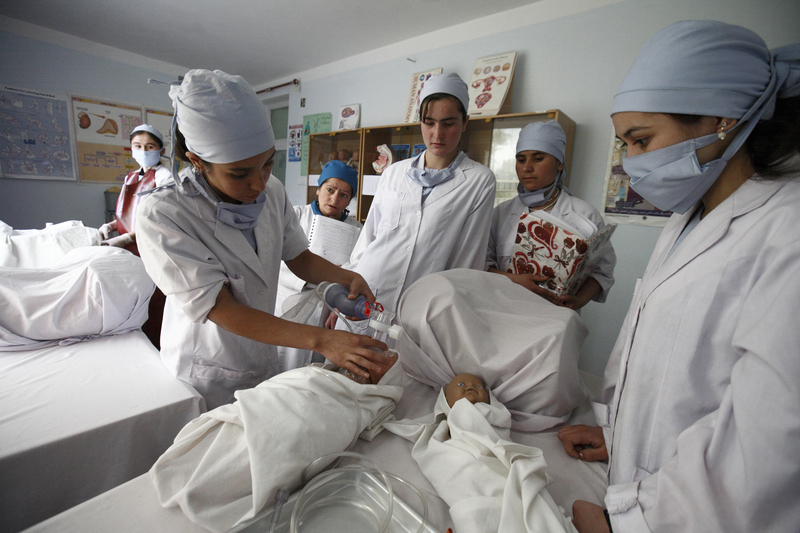 The training of midwives plays a vital role in reducing maternal mortality, which in Afghanistan has dropped from 1,600/100,000 live births in 2003 to 400/100,000 live births in 2015. An e-health system, which allows hospitals serving remoter populations to consult FMIC in Kabul, Aga Khan University Hospital in Karachi and other hospitals, has benefited over 20,000 patients throughout the country. The newly constructed Comprehensive Health Centre (CHC) in Takhar’s Khaja-Bahauddin district, Afghanistan. The Aga Khan Foundation (AKF) works on a number of health fronts, such as increasing breastfeeding, promoting hygiene, nutrition and sanitation, the reduction of infant and maternal mortality and the construction of health facilities. Its ancillary activities in agricultural and food security, nutrition, sanitation and youth employment, among others, all have a bearing on overall health. In addition, AKDN has refurbished a number of facilities, including health centres that had been damaged or neglected. The Aga Khan University (AKU) has also contributed to the revitalisation of national institutions, such as the Government’s Institute of Health Sciences (IHS). Among other institution-strengthening activities, AKDN has set up a science laboratory at HIS and assisted with a revision of the pre-Soviet curriculum, English language skills and computer training. In Afghanistan, the Aga Khan University manages the French Medical Institute for Children as part of a partnership with the governments of France and Afghanistan and the French NGO La Chaine de L’Espoir. AKDN also manages the flagship French Medical Institute for Mothers and Children in Kabul (FMIC). Completed in 2005, the FMIC offers inpatient and outpatient services, paediatric medicine and surgery, cardiology, and orthopaedics. The Institute is one of the few facilities of its kind in Afghanistan to offer screening and diagnosis in a range of radiology services. Equipped to international standards, the hospital provides state-of-the-art medical and surgical techniques. Its laboratory, affiliated with the Aga Khan University (AKU) in Karachi, is developing expertise in microbiology, haematology, serology and biochemistry services. Managed by the Aga Khan University (AKU) as part of a partnership with the governments of France and Afghanistan and the French NGO, La Chaine de L’Espoir, it was the first hospital in Afghanistan to perform open and closed heart surgeries. Since its opening, FMIC has recorded nearly 780,000 patient visits and performed more than 22,800 surgeries (of which over 2,300 were cardiac surgeries), 470,000 radiology procedures and 2.5 million laboratory tests. It has also provided care worth more than $25 million at no charge. Zahra (34), from the Felati district, watches her six-month old son, Ali Sina, who is being treated for pneumonia at the Bamyan Hospital in Afghanistan. Health care in the mountains of Afghanistan can be a challenge, particularly for women and children. Until recently, many areas had only one doctor for every 50,000 inhabitants, midwife training programmes were dormant until the early 2000s and over 90 percent of private pharmaceutical outlets did not have even five essential drugs in stock. Even today, 10 percent of children die before the age of five. An Afghan woman has a 1 in 52 chance of dying due to pregnancy or childbirth. These conditions disproportionately affect remote, rural areas, where health facilities are often inadequate or do not exist at all. The case for upgrading the provincial Hospital in Bamyan was clear. When the Aga Khan Health Services (AKHS) took responsibility for the operations of the Bamyan Provincial Hospital in 2004, medical staff at the Hospital’s old facility were struggling to meet the health needs of the community. Through a public-private partnership with the Government of Afghanistan, AKHS undertook the challenge of upgrading the Hospital to meet Afghanistan’s Essential Package of Hospital Services. The old Hospital was upgraded and expanded. New equipment was installed and a stock of medicines was secured. Training programmes for staff started. The staff and services at the Hospital steadily improved, through upgrades to training and equipment under the management of AKHS. The 35-bed facility – of which 15 beds were originally in tents – grew to accommodate 100 beds and expanded to services such as diagnostics and surgery. Over the course of little over a decade, the number of admissions to the old Bamyan Hospital had risen from 1,900 in 2004 to more than 11,000 in 2016. Outpatient attendances had increased from 43,000 to 175,000; deliveries from 100 to more than 3,000; and the number of major operations from 150 to more than 600. It was clear that the hospital needed to expand. However, expansion of the existing Hospital had its limits. As a response to the clear need for a purpose-built facility, the local Bamyan government allocated 6.4 acres for a new Hospital to be built on the outskirts of town. Construction began in 2013, led by the Aga Khan Agency for Habitat, which specialises in ecologically friendly and seismic-resistant construction. The new facility cost US$22.8 million (30.3 million CAD) to build, of which US$17 million (23 million CAD) was funded by the Government of Canada. Aga Khan Foundation Canada contributed US$3.2 million (4.3 million CAD) to the construction, and the Government of France donated US$2.3 million (3 million CAD). In October 2016, the Hospital services moved from the old to the new premises. The new 141-bed, state-of-the-art Hospital is designed to be structurally safe, seismic-resistant and highly energy-efficient. The Hospital’s innovative “rammed earth” construction was designed to be both durable and to blend in with the environment. Rammed earth also provides for better insulation. Over half of the new Hospital’s power is supplied by solar panels located on a hilltop behind the Hospital, on a piece of land donated by the Bamyan government.